There is a debate several years old and still going on about sliders. Some people say sliders are bad for the conversion rates, and based on the latest data from many e-commerce businesses, they are right. However, people are still using sliders on their websites and see more benefits from it than drawbacks. In my honest opinion, I prefer sliders than a boring plain website. It adds some colors and allows to display a lot more important information on the front page which is a great feature and probably the best one. If you like sliders and thinking of using it like me, for easiest slider usage I recommend using WordPress. There is a free WordPress slider plugin that I prefer. With this plugin, even the least experienced WP users can have a go at building a phenomenal slider. I am going to review the features and possibilities of this plugin and you will be left only to decide whether to use a slider plugin on your website or not. Smart Slider 3 is a great free WordPress slider plugin. It has a bunch of features that will allow you to create the most stunning and appealing slider possible. Most importantly, this plugin does not require any prior coding experience as well as it has easy to understand and navigate user-interface. You can check this tutorial to learn how to add it to your website. It is really important that your website’s slider would look nice on any browser as well as the device. The Smart Slider 3 plugin allows you to create responsive sliders that will look stunning on any phone, tablet or browser. Also, the plugin allows you to make specific adjustments according to the device to make the results even better. Nobody got time to make something from scratch, and why we should create things that already created? 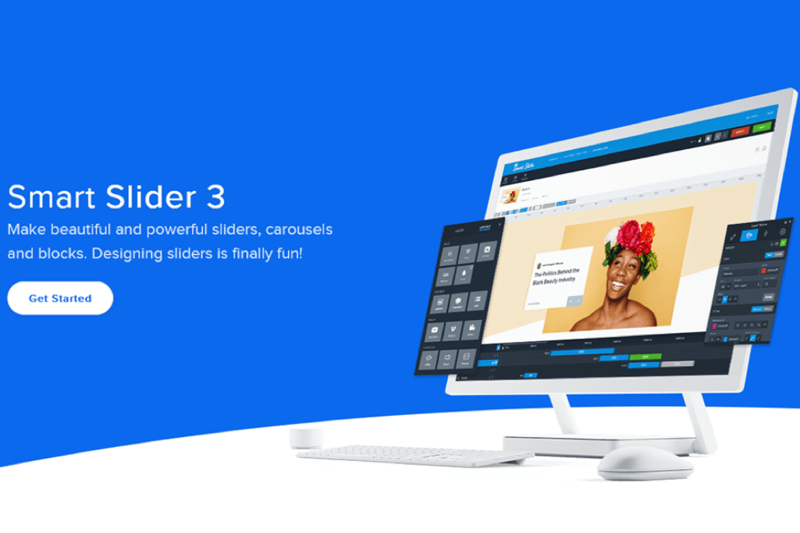 The Smart Slider 3 provides its users with a couple of free sliders and slide templates for you to use. You can use them to get inspiration and the main idea of how slider should look or you can use it directly on your site without creating a new one. The templates are easily importable to the website with only one click install and you can modify those templates according to your needs. Aside from free slide templates, there is a huge pre-made slide library where you can find slides for any kind of website. The library will provide you with more than 100 possible slide template variations that will help to kickstart your slide creating process. Also, it allows to customize those slides the way you want and need. By doing this, you will save a lot of time. The Smart Slider 3 plugin has a really beautiful and intuitive slide editor. It does not require any coding and makes the creation of slides fast and efficient. The plugin has a lot of similarities to any image editor out there so you will easily understand how to use it. It gives a complete freedom of choice and you can edit everything in your slides without any restrictions. One of the unique features of the Smart Slider 3 is that it provides you with layers. Every piece of text, image, button, heading, and video has its unique layer and can be edited separately by selecting it. You can easily change the details in your slider from typography to the overall style. These days, SEO is the king and it is important that your website would be SEO optimized. This plugin is SEO optimized as well as it has smart image cropping. One of the most frustrating details for me in articles is the different size of pictures in it. Not only it is not visually appealing to readers, but also it is bad for SEO. The Smart Slider 3 automatically crops and positions the image that it would fit perfectly into the sliders frame. The Smart Slider 3 is a beautifully designed plugin with a very high level of customizability. It has tons of features to offer and it should fit everyone’s needs. The free version should be enough for most of the people, however, you might take a look at the pro version for $25 that offers even more slide templates and advanced features. The plugin is easy to use and if you come up with some problem, they have an amazing customer support team to help you.